Legacy Family Tree announced the new Version 9 of their genealogy management program yesterday - see Legacy Family Tree Version 9 Released - Lots of New Features! for more details. I am particularly interested in how they obtain and use Hints. They claim that their Hinting system finds records in FamilySearch, MyHeritage, Findmypast and Genealogy Bank. 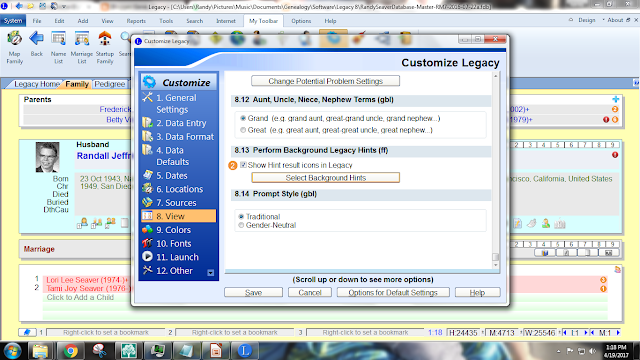 "The Legacy Hints screen is reached by clicking the Select Background Hints button on option 8.13 on the View screen of the Customize Legacy window (reached by choosing Customize from the Options tab of the Ribbon bar." I checked all four websites for Hints, since I have a subscription to all of them. 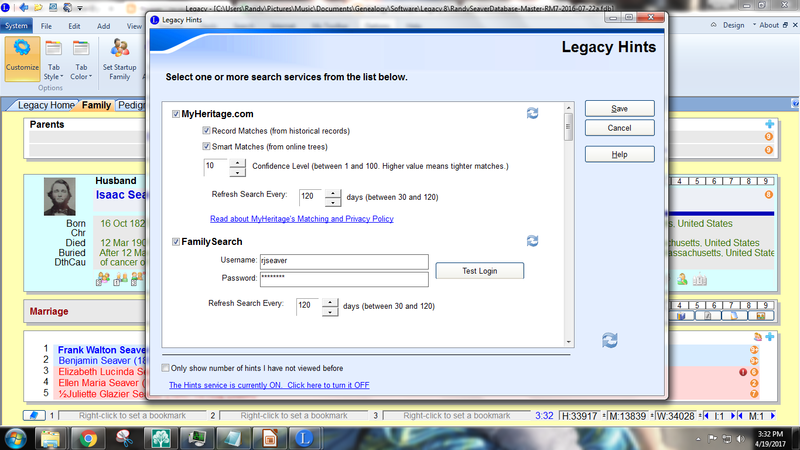 * MyHeritage.com will find Record Matches (records) and/or Smart Matches (tree profiles) - I clicked both of them. The user can select the quality of the matches - 10 (out of 100) was the default and I kept it. * FamilySearch wanted my userID and password. There is a button to check the Login. * Findmypast.com - had no options. * GenealogyBank had no options. The user can choose how often they want to update the Hints from each site - between 30 and 120 days - I kept it at 120 days for now. I clicked on the "Save" button on the screen above and was ready to see if Hints appear in my Legacy family tree database. On the right of the person's name, there are small orange-colored circles with white numbers inside the circle that indicate there are Hints for that person. 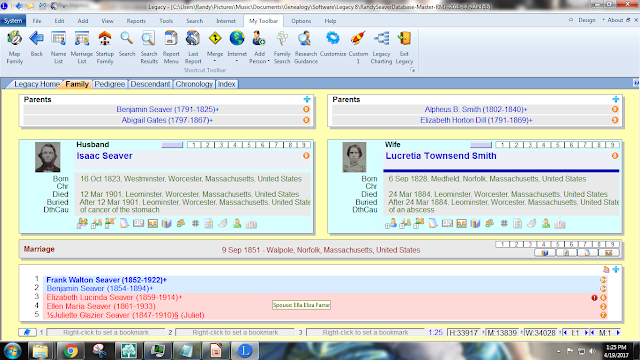 FamilySearch provides an itemized list of the records found there, and indicates whether they are pending, accepted or ignored. 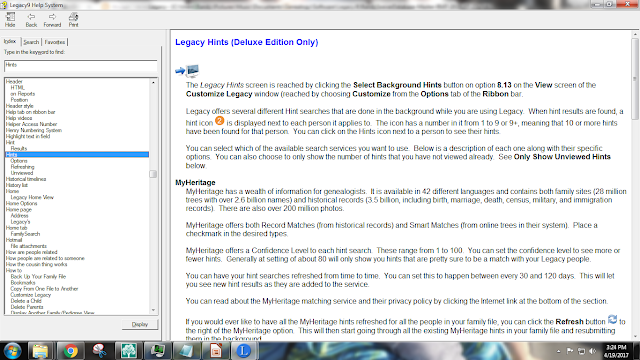 Findmypast, MyHeritage and GenealogyBank just tell you how many Hints there are. 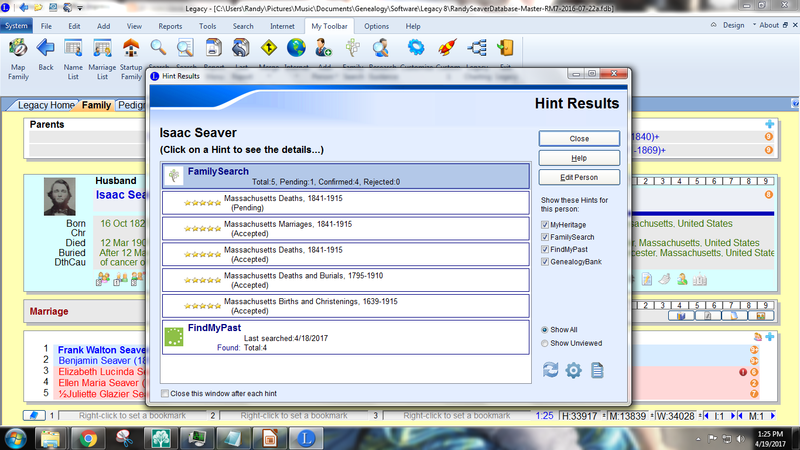 On the screen above, Findmypast said there were 4 Hints. Apparently, I had no MyHeritage or GenealogyBank Hinrts for Isaac Seaver. 3) I clicked on one of the FamilySearch Hints, and could add the record content to the profile for that person in the FamilySearch Family Tree. I could choose each Hint, review the Hint information, and I could add content and the source citation to my Legacy Family Tree person. I could not Accept the Hint on Findmypast without jumping through some hoops. There were only 4 Hints on Findmypast using Legacy Family Tree (two birth records, a marriage record and a census record), but when I logged into Findmypast I saw that there were 8 Hints (two birth records, four marriage records, and two census records). I don't know why the Legacy Hint system did not find all 8 of them. 5) Adding content to your Legacy Family Tree is not automagical for any of the websites - you have to go into the person's "Individual's Information" screen to manually add events, dates, places, source citations, media, notes, etc. The "Hint Results" screen has a button to "Edit Person" so you don't have to click out of the "Hint Results" and can get back to that screen after adding content to the "Individual Information" screen. 6) I had no problems getting the Hints - they just appeared for every person I put on my Legacy screen. Sometimes it is immediate, other times it takes 5 to 20 seconds for the orange Hints icon for parents or children of a person to appear. 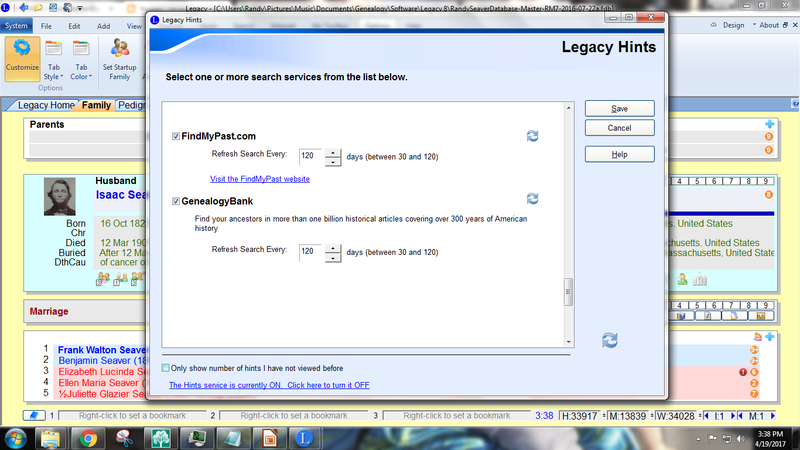 7) After clicking on the Hint icon for about 50 persons in my Legacy tree, I was able to see Hints for GenealogyBank occasionally, but I never saw a Hint from MyHeritage for some reason. 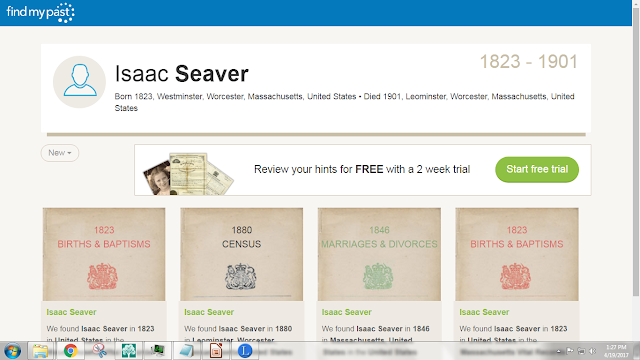 I looked on MyHeritage for Isaac Seaver and saw that there were 10 Record Matches for him, with only two of them accepted. Is that a problem with the link between MyHeritage and Legacy, or a user error of mine? Thank you for this step-by-step post. I just upgraded to Legacy version 9 today and was poking around, trying to find the Hints too!